The five Olympic rings were designed in 1913, adopted in 1914 and debuted at the Games at Antwerp in 1920. The Olympic Games (often referred to simply as The Olympics) are the worlds premier multi-sport international athletic competition held every four years in various locations. Separate summer and winter games are now held two years apart from each other. Until 1992, they were held in the same year. The original Olympic Games began in c. 776 B.C.E. in Olympia, Greece, and were hosted for nearly a thousand years, until 393 C.E.. The Greek games were one of the splendors of the ancient world, so much so that warring factions took breaks so their athletes could compete. The games gradually lost popular support, however, as the ascendant Roman Empire hosted far bloodier and more spectacular gladiatorial combat, and the later Christianized empire saw the games as recalling pagan festivals. Greek philanthropist Evangelos Zappas sponsored the first modern international Olympic Games in 1859. The International Olympic Committee (IOC) was founded in 1894, and the first of the IOC's Olympic Games were the 1896 Summer Olympics, held in Athens. Participation in the Olympic Games has increased to include athletes from nearly all nations worldwide. With the improvement of satellite communications and global telecasts of the events, the Olympics have grown into a global media phenomenon, with cities worldwide vying for the coveted opportunity to host the games. When the modern Olympics resumed in 1896, there was hope that such grand-scale athletic competition could be a force for peace. Competitive sports showcase human excellence, self mastery, and cooperative teamwork. Sports are played in remote villages and great cities on every continent and provide a bridge across religious, social, and ethnic divides. For a time the Olympic dream lasted, yet as world war twice engulfed nations in the twentieth century, and the Cold War divided peoples and states, the Olympics succumbed to nationalistic triumphalism, cheating scandals, and crass commercialism. The Olympics continue to engender pride in human accomplishment and respect for political adversaries, yet the promise of the Olympics to rise above about political divisions and exemplify human ideals remains to be realized. According to legend, the divine hero Heracles was the creator of the Olympic Games and built the Olympic stadium and surrounding buildings as an honor to his father Zeus, after completing his 12 labors. According to that legend he walked in a straight line for 400 strides and called this distance a "stadion" (Greek: "Στάδιον"), which later also became a distance calculation unit. This is also why a modern stadium is 400 meters in circumference length. Another myth associates the first Games with the ancient Greek concept of ἐκεχειρία (ekecheiria) or Olympic Truce, in which a solemn truce was enacted between warring city-states to allow athletes to compete in the Games. The date of the Games' is often reconstructed as 776 B.C.E., although scholarly opinion ranges between dates as early as 884 B.C.E. and as late as 704 B.C.E.. The Games quickly became an important institution throughout ancient Greece, reaching their zenith in the sixth and fifth centuries B.C.E.. The Olympics were of fundamental religious importance, contests alternating with sacrifices and ceremonies honoring both Zeus (whose colossal statue stood at Olympia), and Pelops, divine hero and mythical king of Olympia, famous for his legendary chariot race, in whose honor the games were held. At first involving only a foot race, then wrestling and the pentathlon, the number of events increased to 20, and the celebration was spread over several days. Winners of the events were greatly admired and were immortalized in poems and statues. The Games were held every four years, and the period between two celebrations became known as an 'Olympiad'. The Greeks used Olympiads as one of their methods to count years. The most famous Olympic athlete lived in the sixth century B.C.E., wrestler Milo of Croton, the only athlete in history to win a victory in six Olympics. The Games gradually declined in importance as the Romans gained power in Greece. When Christianity became the official religion of the Roman Empire, the Olympic Games were seen as a pagan festival in discord with Christian ethics, and in 393 C.E. the emperor Theodosius I outlawed the Olympics, ending a thousand-year tradition. During ancient times normally only young men could participate. Competitors were usually naked, as the festival was meant to be, in part, a celebration of the achievements of the human body. Upon winning the games, the victor would not only have the prestige of being in first place but would also be presented with a crown of olive leaves. Even though the bearing of a torch formed an integral aspect of many Greek ceremonies, the ancient Olympic Games did not include it, nor was there a symbol formed by interconnecting rings. These Olympic symbols were introduced as part of the modern Olympic Games. In the early seventeenth century, an "Olympick Games" sports festival was run for several years at Chipping Campden in the English Cotswolds, and the present day local Cotswold Games trace their origin to this festival. In 1850, an "Olympian Class" was begun at Much Wenlock in Shropshire, England. This was renamed "Wenlock Olympian Games" in 1859 and continues to this day as the Wenlock Olympian Society Annual Games. A national Olympic Games was organized by their founder, Dr William Penny Brookes, at Crystal Palace in London, in 1866. Meanwhile, a wealthy Greek [[philanthropy|philanthropist], Evangelos Zappas, sponsored the revival of the first modern international Olympic Games. The first of these were held in an Athens city square in 1859. 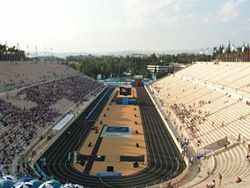 Zappas paid for the refurbishment of the ancient Panathenian stadium, which was first used for an Olympic Games in 1870 and then again in 1875. The revival included athletes from two countries, representing very different cultures: Greece and the Ottoman Empire. The interest in reviving the Olympics as an international event grew further when the ruins of ancient Olympia were uncovered by German archaeologists in the mid-nineteenth century. Baron Pierre de Coubertin founded the International Olympic Committee, and at a congress at the Sorbonne University, in Paris, held from June 16 to June 23, 1894, it was decided that the first IOC Olympic Games would take place in 1896 in Athens, in the country of their birth. To organize the Games, Demetrius Vikelas was named as the IOC's first president. The Panathenian stadium that was used for Olympic Games in 1870, and 1875 was refurbished and used again for the Olympic Games held in Athens in 1896. The total number of athletes at the first IOC Olympic Games, less than 250, seems small by modern standards, but the games were the largest international sports event ever held until that time. Greek officials and the public were very enthusiastic and proposed to have the monopoly over organizing the Olympics. The IOC decided differently, however, and the second Olympic Games took place in Paris. This was also the first Olympic Games where women were allowed to compete. After the initial success, the Olympics struggled. The celebrations in Paris (1900) and St. Louis (1904) were overshadowed by the World's Fair exhibitions in which they were included. The 1906 Intercalated Games (so called because of their off-year status) were held in Athens. Although originally the IOC recognized and supported these games, they are currently not recognized by the IOC as official Olympic Games. The 1906 Games, however, again attracted a broad international field of participants—in 1904 at St. Louis, 80 percent had been American—and of great public interest, thereby marking the beginning of a rise in popularity and size of the Games. From the 241 participants from 14 nations in 1896, the Games grew to more than 11,000 competitors from 202 countries at the 2004 Summer Olympics, again held in Athens. The number of competitors at the Winter Olympics is much smaller than at the Summer Games; at the 2006 Winter Olympics in Turin Italy, 2,633 athletes from 80 countries competed in 84 events. The Olympics are one of the world's largest media events. In Sydney in 2000 there were over 16,000 broadcasters and journalists, and an estimated 3.8 billion viewers watched the games on television. The growth of the Olympics is one of the largest problems the Olympics face today. Although allowing professional athletes and attracting sponsorships from major international companies solved financial problems in the 1980s, the large number of athletes, media and spectators makes it difficult and expensive for host cities to organize the Olympics. At last count, 203 nations participated in the Olympics. This is a noticeably higher number than the number of countries recognized by the United Nations, which is only 193. This is because the IOC allows colonies and dependencies to sponsor their own Olympic teams and athletes even if such competitors hold the same citizenship as another member nation. The English public schools of the second half of the nineteenth century had a major influence on many sports. They subscribed to the Ancient Greek and Roman belief that sport formed an important part of education. Initially, professional athletes were not allowed to compete in the Olympic Games. A short-lived exception was made for professional fencing instructors. This exclusion of professionals has caused several controversies throughout the history of the modern Olympics. 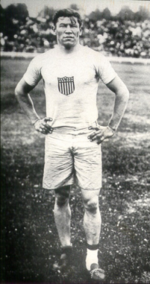 The 1912 Olympic pentathlon and decathlon champion, Jim Thorpe, was disqualified when it was discovered that he played semi-professional baseball prior to winning his medals. He was restored as a champion on compassionate grounds by the IOC in 1983. Swiss and Austrian skiers boycotted the 1936 Winter Olympics in support of their skiing teachers, who were not allowed to compete because they earned money with their sport and were considered professionals. It gradually became clear to many that the amateurism rules had become outdated, not least because the self-financed amateurs of Western countries often were no match for the state-sponsored "full-time amateurs" of Eastern-bloc countries. In addition, many of the world's best athletes could not participate in important spectator sports, reducing the popularity of some Olympic contests. In the 1970s, amateurism requirements were dropped from the Olympic Charter, leaving decisions on professional participation to the international federation for each sport. As of 2004, the only sport in which no professionals compete is boxing; and in men's football (soccer), the number of players over 23 years-of-age is limited to three per team. Currently, the Olympic program consists of 35 different sports, 53 disciplines, and more than 400 events. The Summer Olympics includes 28 sports with 38 disciplines and the Winter Olympics includes seven sports with 15 disciplines. Nine sports were on the original modern Olympic program in 1896: athletics, cycling, fencing, gymnastics, weightlifting, shooting, swimming, tennis, and wrestling. rowing events were scheduled as well, but had to be canceled due to bad weather. Cross country skiing, figure skating, ice hockey, Nordic combined, ski jumping, and speed skating have been featured on the program at all Winter Olympics. Figure skating and ice hockey also had been contested as part of the Summer Games before the introduction of separate Winter Olympics. In recent years, the IOC has added several new sports to the program to attract attention from young spectators. Examples of such sports include snowboarding and beach volleyball. The growth of the Olympics also means that some less popular (modern pentathlon) or expensive (white water canoeing) sports may lose their place on the Olympic program. The IOC decided to discontinue baseball and softball beginning in 2012. Rule 48.1 of the Olympic Charter requires that there be a minimum of 15 Olympic sports at each Summer Games. However, each sport may have many "events," such as competitions in various weight classes, styles (as in swimming styles), men's and women's events, etc. Following the 2002 Games, the IOC decided to limit the program of the Summer Games to a maximum of 28 sports, 301 events, and 10,500 athletes. The Olympic sports are defined as those governed by the International Federations listed in Rule 46 of the Olympic Charter. A two-thirds vote of the IOC is required to amend the Charter to promote a Recognized Federation to Olympic status and therefore make the sports it governs eligible for inclusion on the Olympic program. Rule 47 of the Charter requires that only Olympic sports may be included in the program. The IOC reviews the Olympic program at the first Session following each Olympiad. A simple majority is required for an Olympic sport to be included in the Olympic program. 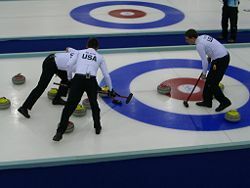 Under the current rules, an Olympic sport not selected for inclusion in a particular Games remains an Olympic sport and may be included again later with a simple majority. The IOC has slated 26 sports to be included in the program for London 2012. 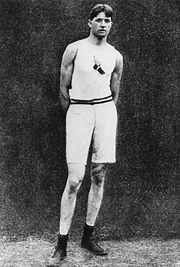 Ray Ewry is the only competitor with ten modern Olympic titles, but two of them are from the 1906 Intercalated Games, which are not included in the official records. The athletes (or teams) who place first, second, or third in each event receive medals. The winners receive "gold medals." (Though they were solid gold until 1912, they are now made of gilded silver.) The runners-up receive silver medals, and the third-place athletes receive bronze medals. In some events contested by a single-elimination tournament (most notably boxing), a third place might not be determined, in which case both semi-final losers receive bronze medals. The practice of awarding medals to the top three competitors was introduced in 1904; at the 1896 Olympics only the first two received a medal, silver and bronze, while various prizes were awarded in 1900. In addition, from 1948 onward athletes placing fourth, fifth and sixth have received certificates which became officially known as "victory diplomas;" since 1976 the medal winners have received these also, and in 1984 victory diplomas for seventh- and eighth-place finishers were added. At the 2004 Summer Olympics in Athens, the first three were given wreaths as well as their medals. Athletes and the public often consider Olympic medals as more valuable than world championships and medals from other international tournaments. Many athletes have become heroes in their own country after becoming Olympic champions. The diversity of the sports, and the great differences between the Olympic Games in 1896 and today make it difficult to decide which athlete is the most successful Olympic athlete of all time. This is further complicated because the IOC no longer recognizes the Intercalated Games which it originally organized. In terms of the number of titles won at the modern Olympic Games, the following athletes may be considered the most successful. The IOC ranks countries according to a medal tally chart based on the number of gold medals awarded to each country. Where states have equal numbers of gold medals, the number of silver medals, and then bronze medals, are counted to determine rankings. Since 1996, the only countries that have consistently appeared in the top 10 medal tallies for summer Olympics have been the Russian Federation, United States, China, France, Germany, Australia and Italy. Since 1994, the only countries that have appeared in the top 10 medal tallies for winter Olympics have been the Russian Federation, United States, Canada, Germany, Austria, and Italy. At the heart of the Olympic Movement is the International Olympic Committee (IOC). It can be seen as the government of the Olympics, as it takes care of the daily problems and makes all important decisions, such as choosing the host city of the Games, and the program of the Olympics. Organizing Committees for the Olympic Games (OCOGs), which take care of the organization of a specific celebration of the Olympics. The Olympic movement uses many symbols, most of them representing IOC founder Coubertin's ideals. The best-known symbol is the Olympic Rings. These five intertwined rings represent the unity of five inhabited continents (with America regarded as one single continent). They appear in five colors on a white field on the Olympic Flag. These colors, white (for the field), red, blue, green, yellow, and black were chosen such that each nation had at least one of these colors in its national flag. The flag was adopted in 1914, but the first Games at which it was flown was the Antwerp, 1920. It is hoisted at each celebration of the Games. The Olympic Flame is lit in Olympia, Greece and brought to the host city by runners carrying the torch in relay. There it plays an important role in the opening ceremonies. 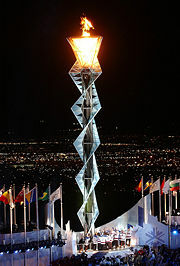 The torch fire has been featured since 1928, but the relay was not introduced until 1936. Apart from the traditional elements, the host nation ordinarily presents artistic displays of dance and theater representative of that country. Various traditional elements frame the opening ceremonies of a celebration of the Olympic Games. The ceremonies typically start with the hoisting of the host country's flag and the performing of its national anthem. The traditional part of the ceremonies starts with a "parade of nations" (or of athletes), during which most participating athletes march into the stadium, country by country. One honored athlete, typically a top competitor, from each country carries the flag of his or her nation, leading the entourage of other athletes from that country. Greece normally marches first, because of its historical status as the origin of the Olympics, while the host nation marches last. All other participating nations march in alphabetical order based on the dominant language of the host country, or in French or English alphabetical order if the host country does not write its dominant language in an alphabet with a set order. For example, in the XVIII Olympic Winter Games in Nagano, Japan, nations entered in English alphabetical. After all nations have entered, the president of the host country's Olympic Organizing Committee makes a speech, followed by the IOC president who, at the end of his speech introduces the person who is going to declare the Games open. Despite the Games having been awarded to a particular city and not to the country in general, the opener is usually the host country's Head of State. Next, the Olympic flag is carried horizontally (since the 1960 Summer Olympics) into the stadium and hoisted as the Olympic Anthem is played. The flag bearers of all countries circle a rostrum, where one athlete and one judge speak the Olympic Oath, declaring they will compete and judge according to the rules. Finally, the Olympic Torch is brought into the stadium, passed from athlete to athlete, until it reaches the last carrier of the Torch, often a well-known athlete from the host nation, who lights the fire in the stadium's cauldron. The Olympic Flame has been lit since the 1928 Summer Olympics, but the torch relay did not start until the 1936 Summer Olympics. Beginning at the post-World War I 1920 Summer Olympics, the lighting of the Olympic Flame was for 68 years followed by the release of doves, symbolizing peace. This gesture was discontinued after several doves were burned alive in the Olympic Flame during the opening ceremony of the 1988 Summer Olympics. 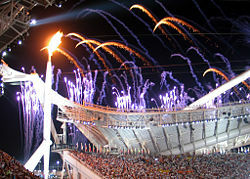 Various traditional elements also frame the closing ceremonies of an Olympic Games, which take place after all of the events have concluded. Flag bearers from each participating delegation enter the stadium in single file, but behind them march all of the athletes without any distinction or grouping of nationality. This tradition began at the 1956 Summer Olympics at the suggestion of Melbourne schoolboy John Ian Wing, who thought it would be a way of bringing the athletes of the world together as "one nation." (In 2006, the athletes marched in with their countrymen, then dispersed and mingled as the ceremonies went on). The Antwerp flag: Was presented to the IOC at the 1920 Summer Olympics by the city of Antwerp, Belgium, and was passed on to the next organizing city of the Summer Olympics until the Games of Seoul 1988. The Oslo flag: Was presented to the IOC at the 1952 Winter Olympics by the city of Oslo, Norway, and is passed on to the next organizing city of the Winter Olympics. The Seoul flag: Was presented to the IOC at the 1988 Summer Olympics by the city of Seoul, South Korea, and is passed on to the next organizing city of the Summer Olympics, which was Barcelona, Spain, at that time. After these traditional elements, the next host nation introduces itself with artistic displays of dance and theater representative of that country. This tradition began with the 1976 Games. This page was last modified on 20 December 2018, at 16:22.